When it comes to the latest in reading technology, I have the Kindle, an iPad, an iPhone 6 Plus. But nothing will ever replace the feel of a hardcover book in my hands. I crave the intimacy of holding a book, its weight, an unbroken spine, the smell of fresh pages or of an old book, its antiqued pages rendered almost transparent by time, the satisfaction of anxiously flipping the page to see what the next will hold. These are the things I can’t give up. But photo albums are a different beast, right? It’s nothing short of revolutionary to have all of your photos available in just a swipe or a keystroke online. Years of photos are stored in chronological order on Photobucket, Flickr, Facebook, or Instagram, out there in the ether for eternity…never to be lost to fire or flood. Plus you can share them instantly, in real time, with everyone you know, plus strangers, too. Then last week, I ordered yet another camera online. It was Best Buy’s Deal of the Day and it was an offer too good to pass up! To my surprise, because it wasn’t advertised, I got a FREE Shutterfly 8×8, 20-page, hardcover photo book with my purchase (a $30 value.) A digital download just appeared in my cart, which was really nothing more than a link to the Shutterfly site where I could create my book. I’d just gotten a new puppy in December. I had literally 100s of photos sprinkled liberally throughout Facebook and Instagram. I decided it was worth my time to sit down and create a book. The fact that Shutterfly let me upload all of my photos directly from Facebook was a huge time-saver. I didn’t have to hunt through all the December folders on my PC to find the photos from my Puppy Shower. All my best (no outtakes, blurry images, etc.) photos were stored by event in Facebook. Yes, I had a puppy shower. What? You mean everyone doesn’t do that? Having created a couple of photo books in the past I knew that I wanted to pay the up-charge for glossy pages, and no black backgrounds. Matte, black pages show fingerprints! However, I did like the matte cover. So I paid an additional up charge for that. Before I started laying out the individual pages, I uploaded all of my best photos to Shutterfly first. Once you start a project in Shutterfly, it creates a gallery for you to upload photos to, and as you use each photo, it disappears from the gallery. That way you don’t leave out any of your favorites. Then rather than simply inserting the photos chronologically, I tried to tell a story from beginning to end. 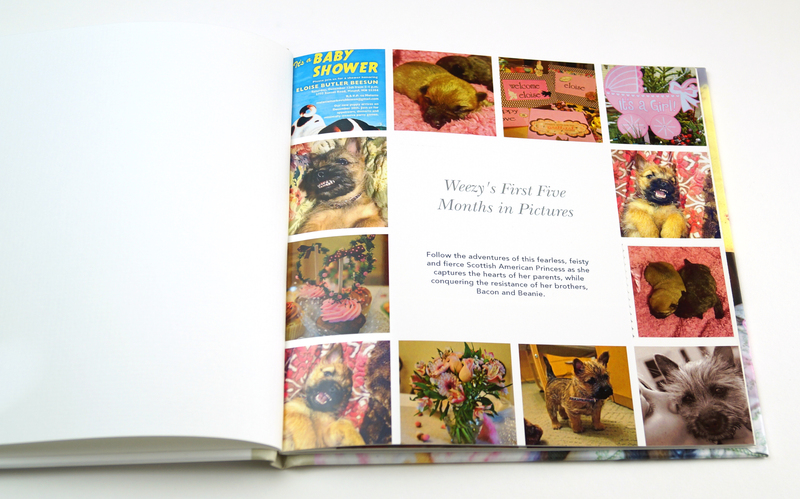 As you can see from the title page, the photos are somewhat chronological, newborn puppy, the puppy shower, the first day home. But I also used specific photos that lent themselves to the template I chose. All the photos fit a square format. And the colors complemented each other. My little fashionista – her big fashion spread. After that, I had pages that were themed, Weezy playing in the snow with her brothers, Weezy’s favorite toys. Weezy’s most adorable outfits, sleepy puppy, and so forth. Once I was finished, the book was so cute, I couldn’t help but pay for expedited shipping. So the whole project ended up costing me about $20. The end result, however, is PRICELESS! I love it. I have to admit, I swooned a little bit when I opened the package, removed the plastic and smelled those fresh glossy pages. Unlike old-school photo albums, I now have a thin, hard-cover book, that’s no thicker than a children’s book, and sits neatly on my bookshelf. Nothing cumbersome, like the Mead Trapper Keeper of yore, with photos falling out, or flimsy cellophane pockets. Plus, Shutterfly also supplied an electronic link to the entire book, including front and back cover, so I could share it electronically by email, or Facebook if I wanted to. 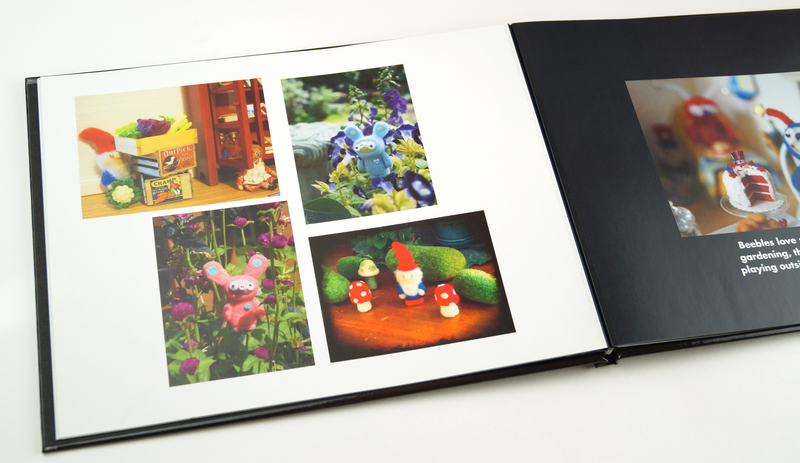 There are a number of photo book sites available online. I’m just very pleased with the quality of Shutterfly’s. I think a lot of people think photo books are just for baby pictures, wedding albums or family vacations. But they’re not! I love creating photo books for out-of-town guests when they come to visit. I send the book to them weeks later after they’ve returned home. And I know how much it’s appreciated because a fabulous friend of mine chronicled our entire trip to Louisiana in a gorgeous photo book, capturing everything from my face covered in powdered sugar from my first beignet, to our up-close and personal encounters with alligators roaming Avery Island. I cherish it! I can relive the whole adventure. Gnomes and other little creatures frolicking in my fairy garden. If you’ve ever fancied the idea of publishing your own book, whether on a hobby, like gardening, birding, embroidery, or writing a children’s book, creating a photo book is a great way to get your feet wet. For instance, I love needle-felting and creating little gnomes and other creatures, and placing them in miniature vignettes. My friends look forward to seeing my posts on Facebook, (or at least they pretend to) so last year I put together a photo book of my miniature scenes as a personal holiday gift. 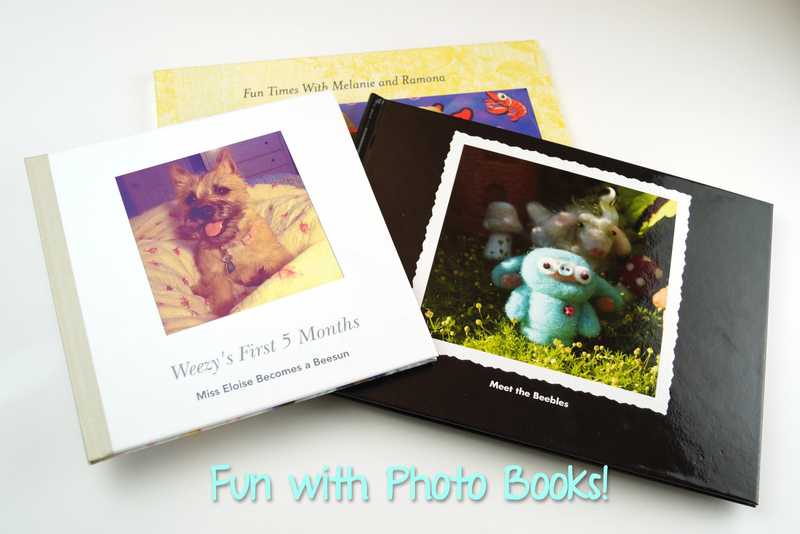 If you have online folders full of photos from your garden, or your hikes through the woods, or boating adventures, take an hour or two and drop them into a photo book. You’ll be surprised at how quickly a book comes together, and how satisfying it is to see your memories come to life in a story, one that you can pull down from the shelf and relive again and again. For more ideas on using your favorite photos in the real world, be sure to visit www.smartperks.com next week for tips on decorating your home with your photography and personal artwork. When she’s not blogging for Smart Perks, Melanie is staring glassy-eyed at Pinterest, her Pin It finger splinted from overuse. Besides crafting, gardening, shopping and cupcakes, the loves of her life include her three naughty terrier pups, the smartest and best-looking dogs in the world, and her husband. Addendum: I received this information on the duration of the free photo book promotion from Best Buy Customer Care. After research, I would like to let you know that most of the cameras we carry come with a free shutterfly photo book. Best Buy regularly includes Shutterfly Photobook codes as promotions for purchases of Digital Cameras, DSLR, Computers, and other products. These codes are a great value to the customers, and are extremely popular. If a specific camera comes with it, the free shutterfly photo book is marked as free bonus item however, we are not certain when this promotion is going to last. This is a partnership between Best Buy and Shutterfly and, I believe the promotion is continuously good until advised by Shutterfly otherwise.